Soooo... my kids have an agent. It sounds quite ridiculous to even say, but that's the world of entertainment for ya! Whenever I post about going to a casting with one of the kids, I get lots of DMs inquiring about how people can get their kids into modeling as well. I figured I'd put together my tips on my site, so that I can direct everyone right here when I'm asked. We had the best of intentions. Christian had already told me which rides he wanted to go on (he studied the map before we even left Brooklyn) and I was scoping out where we’d get the best treats. Our day started a little later than I wanted, but we still made it to the Toy Story parking lot at around 9:15am. We waited in a pretty long line to get on a shuttle to the parks, but then were finally on our way and made it to Disneyland by around 9:45. After a pit stop at the restrooms and picking up our media tickets (2 of our 3 one-day park hopper tickets were gratis, thanks to Disneyland but all opinions are my own), we were headed inside. Our first stop was to get our ears and have the kids’ hats embroidered with their names. It is only an extra $4.99 per hat for the basic lettering (which is still so nice)! 1. Wait for your fave character & follow them to their meet & greet spot. The characters come out of the big door right past the Mad Hatter shop and they’ll interact, hug, high five while they’re on their way to their meet & greet location. If you’d like to get an autograph and photos, it’s best to follow them so you’ll be first in line. Christian wanted to go to ToonTown first, but on our way there, we stopped to ride the Alice in Wonderland ride in Fantasyland. It was a bit dark and a little scary for Christian but we both enjoyed it. The wait was a short 30 minutes. Before heading to ToonTown, we wanted to let Elle get on her very first ride, so we took to the carousel, where we waited less than 5 minutes for our ride (which leads me to my second tip, below)! It’s hard to say whether she enjoyed it or not - she seemed a little confused about what was going on! 2. Download the Disneyland app! The app has a map, along with ride wait times and you’ll be able to plan out where you want to go, which rides you want to get on and when. We spent a little time over in Toon Town, where both kids got to run around and play, before going back to Fantasyland since Christian wanted to ride Dumbo the Flying Elephant (a fave of his from Magic Kingdom at DisneyWorld). This is, unfortunately, where things went downhill. While he and Dre were standing in line, I get a call from Dre that Christian is feeling sick and doesn’t look so good. I thought - he’s probably hungry, let’s go get some food. Which leads me to my third tip (that we didn’t follow!). 3. Bring snacks! We had plenty of snacks at our hotel, but for whatever reason, didn’t bring any with us (besides Cheerios for Elle & my water bottle)! *smacks forehead* Fruit snacks, chips, water, granola bars - things that won’t go bad in heat. My thought was, he’d eat, feel better, and we could continue our day. Boy was I WRONG! If you know Christian, you know he’s always happy, always smiling, always in a good mood. So to see him, at Disneyland - a place he’s been wanting to visit since going to Disneyworld last September - almost in tears because of his belly ache, hurt my heart to no end. I pretty much knew at that point that our day was over. We tried little things to make him feel better, like buying a bubble machine. 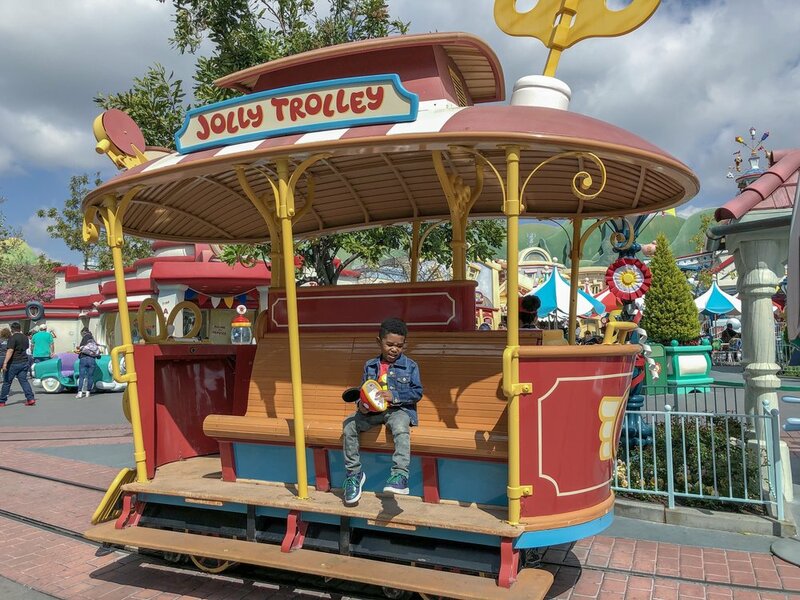 His joy lasted long enough for us to walk into California adventure park, take a few pictures, and head back to the car. I think I was the most devastated, because I know how badly he wanted to spend the day at the parks. And yes, I cried. I can’t believe it, y’all. My girl is ONE. I had this idea that I wanted to write this long insightful post about her first year, but honestly, I don’t have it in me. The past year has been so emotionally draining that all I want to do is celebrate HER. Celebrate that we made it, that I made it, that our girl is happy, loving, strong-willed, beautiful, feisty, smart and funny and we love her to no end. Even though, like the past year, this photoshoot was an extreme challenge, it was SO MUCH FUN! I had a ball planning out the details, picking out her outfit(s) and accessories, combing through Pinterest to find the perfect inspiration, finding the studio and finding the right decorations and putting it all together was so, so satisfying. I couldn’t be happier about the way these images came out. I hope you enjoy! Please feel free to ask me any questions about the process in the comments. Everything the dating “experts” tell you NOT to do/expect is pretty much a part of our story. 3. Had in-house dates early on. 5. Broke up & got back together. 6. Moved in before engagement or any talk of marriage. 7. No magical marriage proposal moment. BUT, here we are, happy and in love. Dre and I met at a club. 😳 It was my friend’s birthday and we had plans to go to Atlantic City for the weekend. At the last minute, she changed her mind and another friend of ours invited us to a party that she was working (as a a promoter). There were 3 of us, my friend & her boyfriend, and me. I knew a lot of people there, so I did my little social butterfly thing and roamed around/danced alone most of the evening so her and the bf could hang. At one point, I wandered, tipsy and in a great mood, over to the bar to get a glass of water - where I bumped into Dre. Literally fell into his arms. The dress I had on had an open back and his hand found his way to my bare back and conversation ensued. Me: My back is sweaty. Dre: *shrugs* I don’t care, do you? I don’t quite remember what else was said #blamethevodka, but at some point he introduced me to his sister and friend who he’d come to the party with. I do remember mentioning where I lived, and him saying that his friend lived a block away. He’ll say I invited him over to our table for a drink but I don’t remember that, I just remember that once I walked away, I kept seeing him every time I turned around. On the dance floor, by the stairs, by our table. LOL. I gave him (& 2 other guys) my number that cold, December Saturday night. Um, no. *ignore* And best believe I won’t be talking to him if he decides to call later. Who does he think he is that he can text me that late, for the first time, and I’m supposed to be ready and willing to talk at that hour. No, again. And I was determined to not even listen to the message. But my curiosity got the best of me, so I finally checked it as I was heading home from work that day. Ugh. He has a nice voice. DOUBLE UGH. He’s witty & funny. So now I have to call him back. I don’t really know what it was, but something about hearing his voice made me smile. Just typing this out now gives me that same happy feeling - what we later called the “warm & fuzzies” for each other. On that call, we planned a first date, and well, it never happened. HE STOOD ME UP! Not really, but I like to say that. LOL! He called me a few hours before our date and told me he was styling a photoshoot and it was running later than he expected so he wouldn’t be able to make it, and politely asked if we could reschedule. He was STYLING A PHOTOSHOOT. If that right there doesn’t tell me we were meant to be together…! So yeah, we rescheduled, had a blast (even though our friends who were on the double date with us were kissing before we’d even hugged each other LOL) and, well there’s a whole lot of other stuff that happened before we got here, but I’m sure you’re just ready to see some cute kids. Maybe I’ll share more of our story later. Until then, feast on the cuteness!